The pivot flex works when four leaves with angles greater than 180° meet at a point. Thus it works on the various star triangle flexagons as well as flexagons made from some rhombuses, pentagons, hexagons, etc. With a star tetraflexagon, start by pulling apart the leaves at the tip of the chevron. Pivot them smoothly across the saddle in the middle of the four triangles and finish by folding it back flat again. 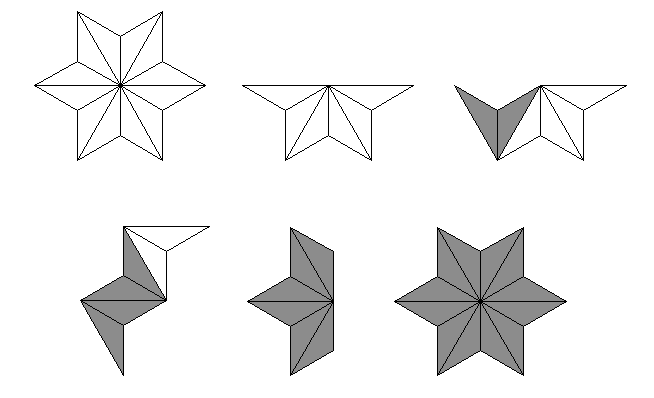 With star triangle flexagons of four or more points, such as the star octaflexagon, star decaflexagon or star dodecaflexagon, you can often combine pivot flexes done in multiple places to reach additional sides. For example, folding a star dodecaflexagon in half may allow three separate pivot flexes.